Allison Borelli graduates as a four-year Spotlight staff member. She has been a student reporter all four years, and features editor for two. Outside of the Spotlight, Allison participated in teen counseling for three years, Key Club for one year, National Honor Society, Literary and Arts Club, soccer, and winter and spring track and field. Allison’s favorite classes during her time at Southern Lehigh were AP Environmental Science, Honors English 11, Creative Writing, and Newspaper Journalism. Outside of school, she volunteers at her camp, and also has been involved with Betty Lou’s Pantry. After graduating, Allison plans to go to Northampton Community College for two years, and then transfer into a four-year college. Right now, she is only thinking about Villanova as an option. She plans to major in environmental science and minor in journalism. In the future, she is thinking about a career as a journalist who writes about the environment. Allison believes being a member of the Spotlight has helped her narrow down her career choices and help her prioritize what she wants to do in the future. She is also grateful that the Spotlight has taught her valuable design skills and given her opportunities she would have never taken before. “[It has made me] become a go getter.” she said. Allison’s most notable moments of high school include being nominated for a soccer scholar athlete award representing Southern Lehigh, and advancing to states for the annual Pennsylvania School Press Association journalism competition. 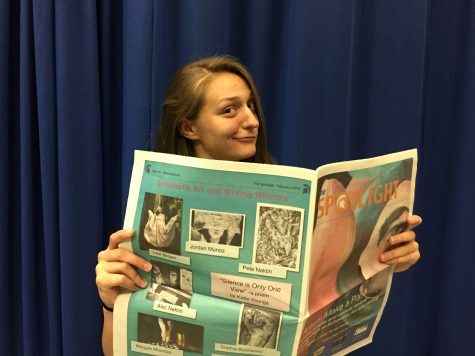 Her proudest moment on the Spotlight is the first time one of her articles got published: “Minecraft: Fun Game or Educational Tool?” Allison’s favorite memory during her time on the newspaper staff was staying at school until 9 p.m. with the other editors to finish putting together an issue. Her advice to high school students is to take advantage of their time because “junior year goes into turbo mode.” She tells students to enjoy high school while they can and not to be afraid to take classes they like. Allison’s hilarious jokes and comments will surely be missed, and the Spotlight wishes her the best of luck in her future!